Want To Guess Which Nintendo Racer Inspired WipEout? Given that Sony's famous futuristic racer WipEout features craft which float just above the track surface, it's reasonable to assume that Nintendo's F-Zero - which predates WipEout by almost five years and also contains anti-gravity racing - would have provided the main inspiration. However, lead designer Nick Burcombe has revealed in an interview with Push Square that although a Nintendo game had a massive influence on WipEout's conception, it's not F-Zero. I was playing the last race of the 150cc cup in Super Mario Kart on the Super Nintendo, and I’d muted the game audio so I could hear my own music. Age of Love was playing on the stereo in the background. I’d tried about ten times to beat the last race, and on this final attempt I was in second place by the time the music was about 2:10 mark. The final laps took place where the track was at 2:45 and it felt so exhilarating; it was as if the music was pushing me on into a deeper gameplay experience. I made it across the line with about a tenth of a second between me and Bowser, who was pushed into second place. The mechanics of Super Mario Kart were virtually flawless, so it was a constant source of inspiration for me. But we obviously couldn’t have banana skins and shells - we had to make it all futuristic and introduce things like electro-bolts and all that kind of sci-fi stuff. It's official, Mario started everything. Well that's a huge surprise. I would have bet my Wii that it was F-Zero! That is an awesome back story. Well I'll be! It just makes you wonder where gaming would be without Mario. See, Sony fans? Even further proof that your company wouldn't be what it is today without Nintendo. Wipeout is awesome as Mario Kart is über awesome. We're lucky to have these racers in our gaming lives. I take it wipeout 3 coming out on wii u is based on the now annoying tv show? This is a bunch of BS. They wholesale ripped off F-Zero's visual style. Its cool the way he remembers his experience in so much detail. They basically merge both Mario Kart and F-Zero together to make WipEout. Actually, Powerdrome predates both F-Zero AND WipEout. 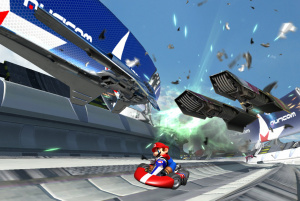 What if Nintendo published the next WipEout game? How cool would that be. gojiguy, calm down and take a chill pill. Nintendo created the Video game world. @grimbldoo is in that game belong to Sony? That's why it would be awesome if they could. Since you have a PSP, get WipEout Pulse and WipeOut Pure. Dear lord some of these comments are stupid. I played it on a friend's PSP once, i thought it was just a mixture of Mario Kart and F-Zero.